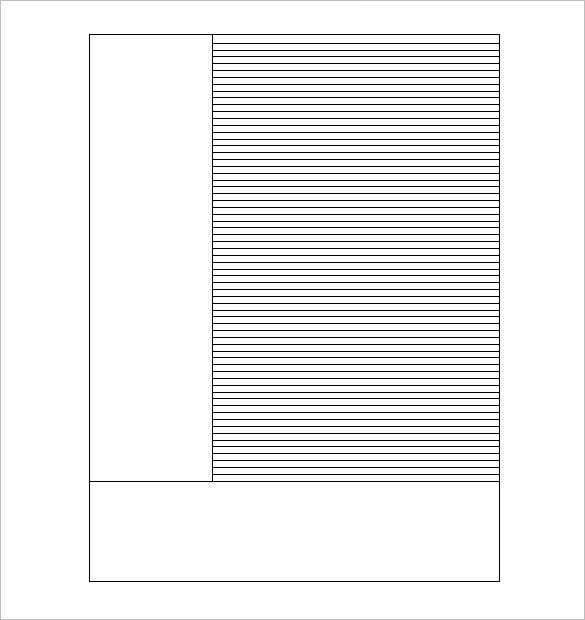 Cornell Notes Template – 51+ Free Word, PDF Format Download! Cornell Notes is simply a note taking system, which was once developed by a teaching instructor at the University of Cornell. Walter Pauk , the man behind this system of note taking, mainly introduced the concept to students to allow them to clearly and easily gather, organize and study their lecture information. Cornell Notes is an effective way to study and prepare for college lessons. In case, you want to teach your students about the Cornell Notes structure through a PPT presentation, a Cornell notes PowerPoint template sample would be handy for you with its readymade structure that can be customized easily. Devised by Cornell University professor Walter Pauk, Cornell Notes system assures a smart way to prepare for your college lessons. Here the note sheet is divided into two columns where one column is meant for the topics and another houses important points on them. 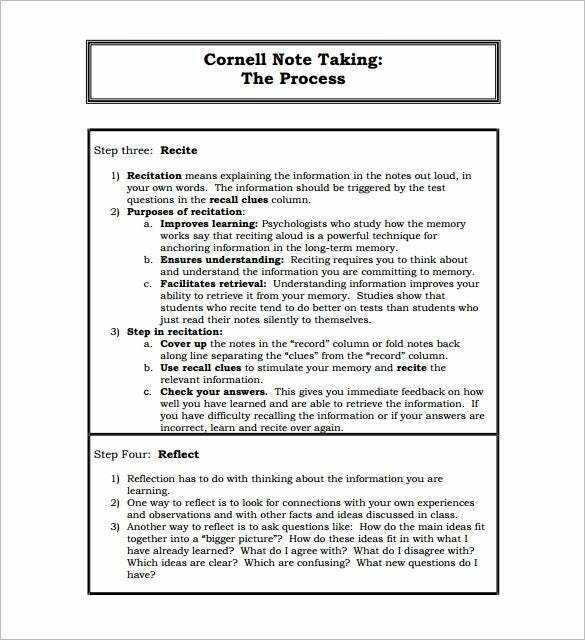 A Cornell note taking template example would help you to prepare the notes in this format. 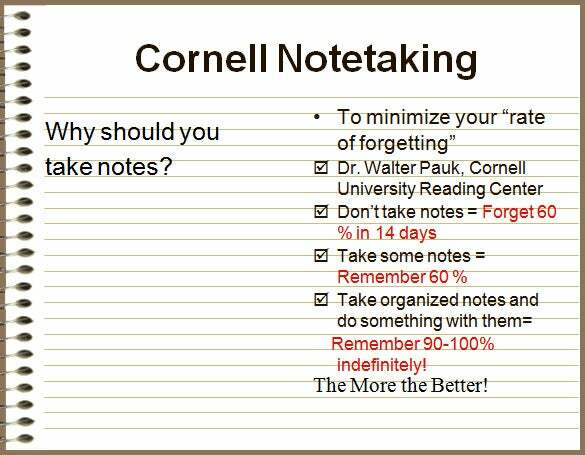 Are you looking to follow the cornell notes format for your college notes? 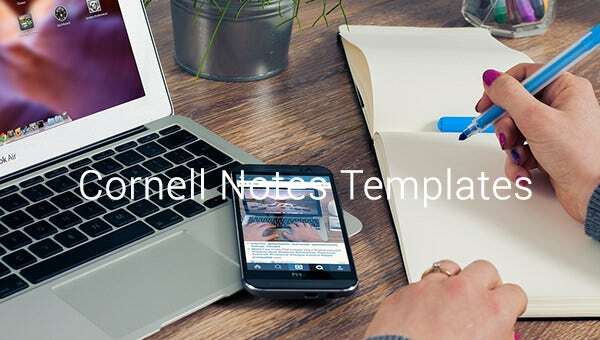 Well, creating the two columns for each of your chapters might be a daunting task and hence it’s smarter to go for the sample Cornell notes template word doc that will help you with the pre-defined and easily customizable columns. 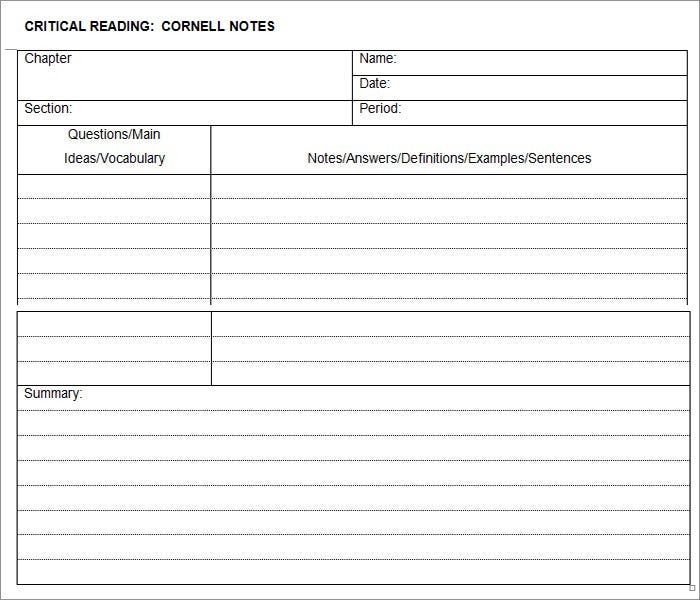 Are you looking for a Cornell notes example word doc? Well, the Cornell Notes system follows a 2-column format. One column is meant for keywords or questions about a topic and another column hosts important data on them. A few lines should be mentioned by the end of the columns which will house the summary of the lesson or topic discussed. 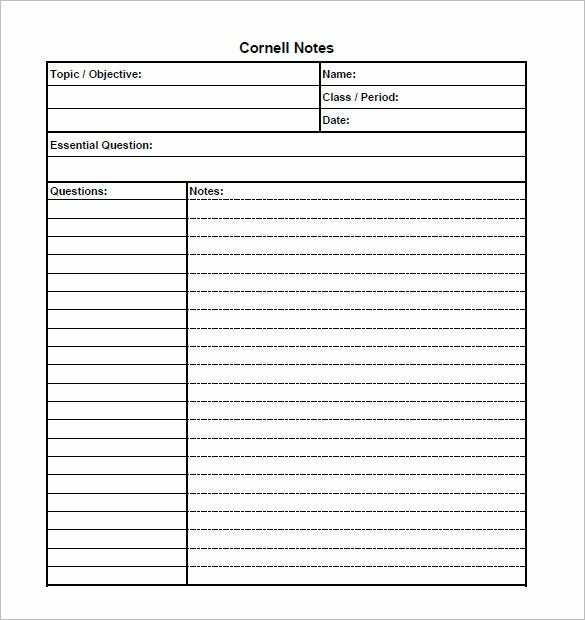 The college students are advised to follow a Cornell notes format sample while taking the class notes as such a format helps in easy review of the topics discussed and test preparation. The said system divides a page in 2 columns where one is dedicated for key questions from the topic and the other one states major details on them. Are you going to prepare Cornell notes structures for your class notes on a Mac system? The good news is that you will get Cornell notes template for Mac word doc today that come up with pre-defined cornell notes columns and space for the summary of the topic to be written down by the end of the columns. 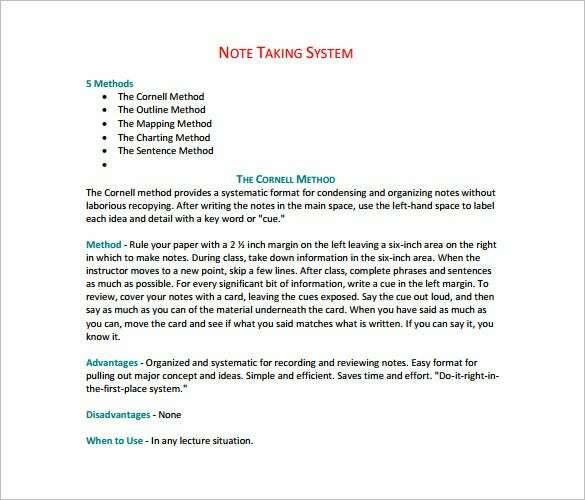 A Cornell note taking system sample assures an easy way to prepare, review and revise the college notes for the tests. In this case, the note sheet is divided into two columns where one states the main questions & the other carries the relevant data by the side of each question. It offers a quick overview on the entire lesson at a glance. 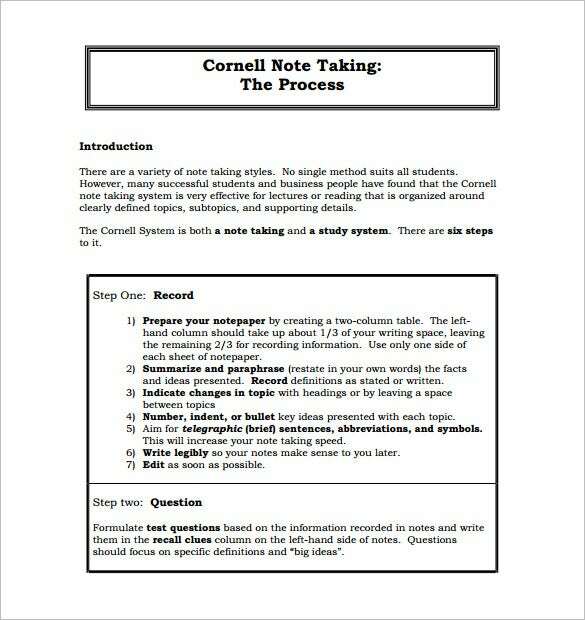 A Cornell method of note taking template example comes in both Microsoft Word and PPT format. The template offers a pre-structured framework for the Cornell notes system so that you don’t have to draft the columns for each of your lessons from the scratch. These templates can be customized easily. 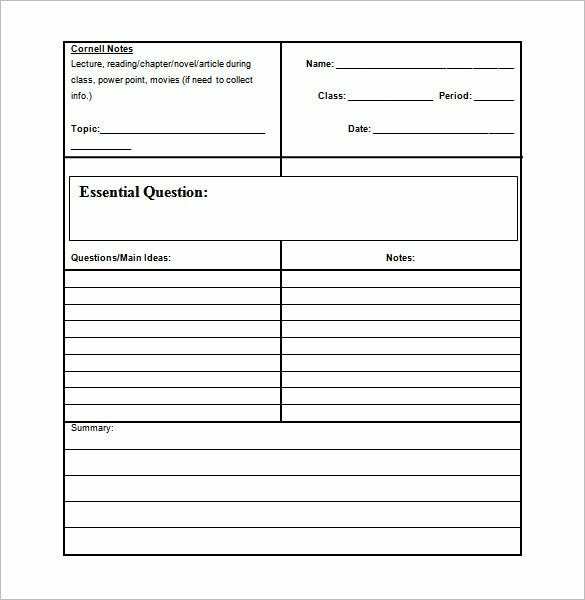 A Cornell notes word template sample will be really helpful when you have to prepare Cornell notes system for all your class notes. The templates arrive with readymade twin set of columns that also assure free of cost word doc download- there will also be the needed blank space for summary. Cornell Notes system ensures easy revision of your class notes at a glance by presenting the important questions and their important pertinent data neatly segregated in two columns. But creating the columns for each of your class notes is daunting and hence you can take to a blank Cornell notes template word doc. 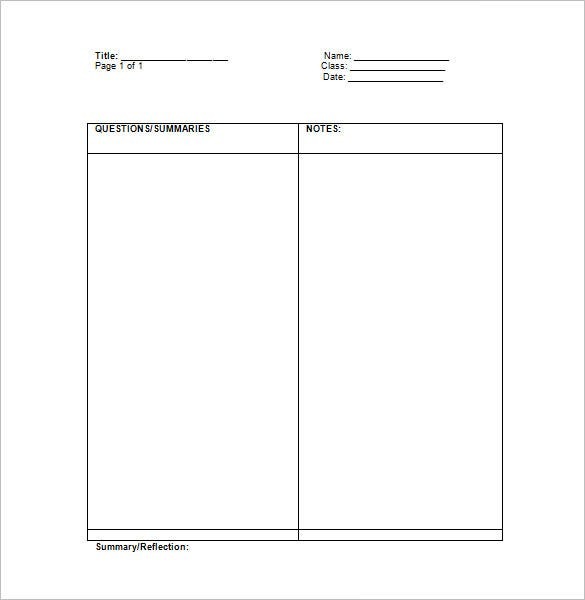 A Cornell notes template Microsoft word sample is a great help for college students who are running out of time to draft twin set of columns for each of their college lessons. The templates help with a pre-defined structure that can be customized easily and are really easy to use. Cornell Notes system, surely, is a brilliant way to arrange your college notes by diving them into key questions and their relevant answers side by side. The structure also offers space for a quick summary for easy comprehension on the topic. 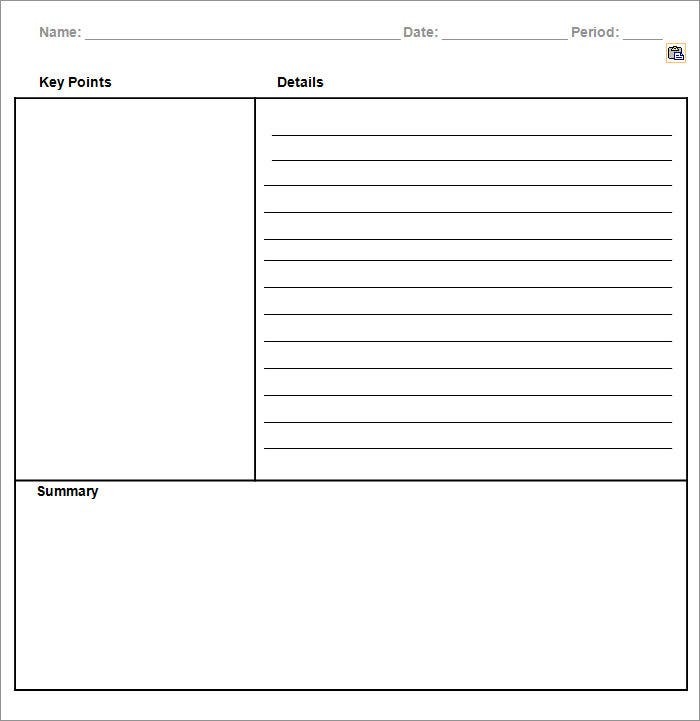 To create your own Cornell Notes system, go for a Cornell notes generator sample. Are you about to create Cornell Notes structure for the first time and looking for the right format? Well, it’s a very easy format where you just create one column for key questions and another bigger one for important details on them. 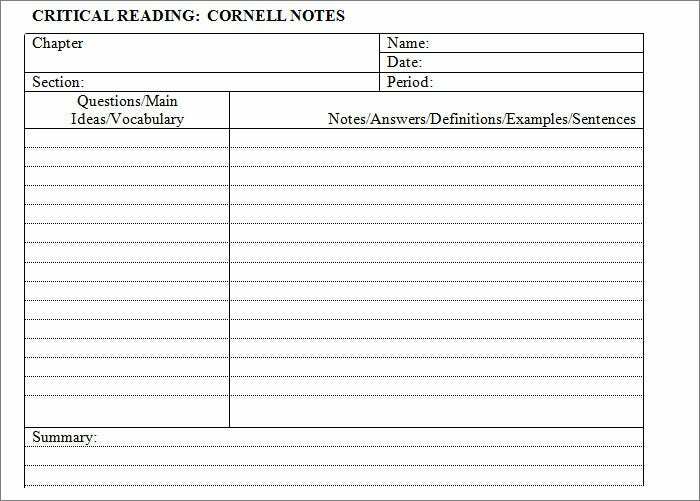 A Cornell notes report template example also offers some space as the columns end for a quick summary. 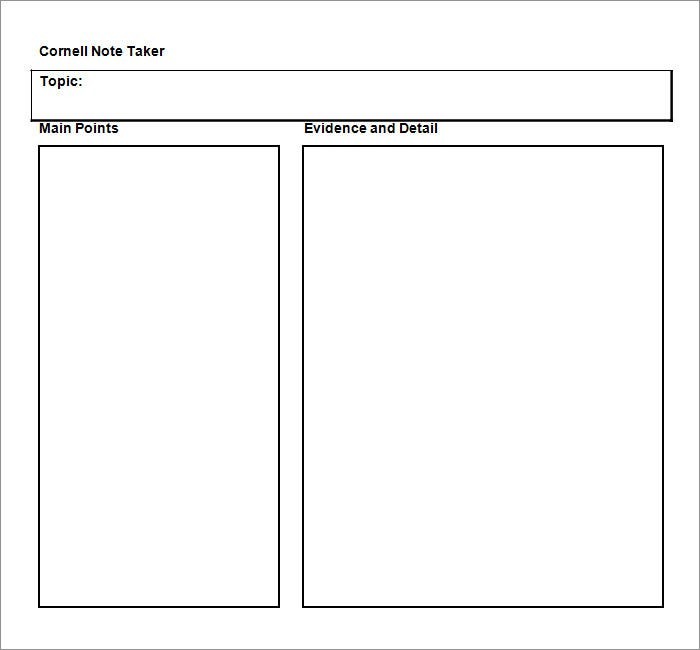 A printable Cornell notes template sample can be used for both study and business. In both ways, it saves you from creating the columns by offering a readymade Cornell Notes structure with pre-structured columns. A lot of such templates are available for free print and are easily customizable with your own study or business data. Akin to college students, business people too can utilize the Cornell Notes system. You can especially use the Cornell notes for business example during the meeting. You can mention the key agendas discussed in the question column while the notes column can be filled with important points discussed on each agenda. Cornell Notes system of note taking is really popular given its neat, organized structure that enables the students to revise the notes easily. 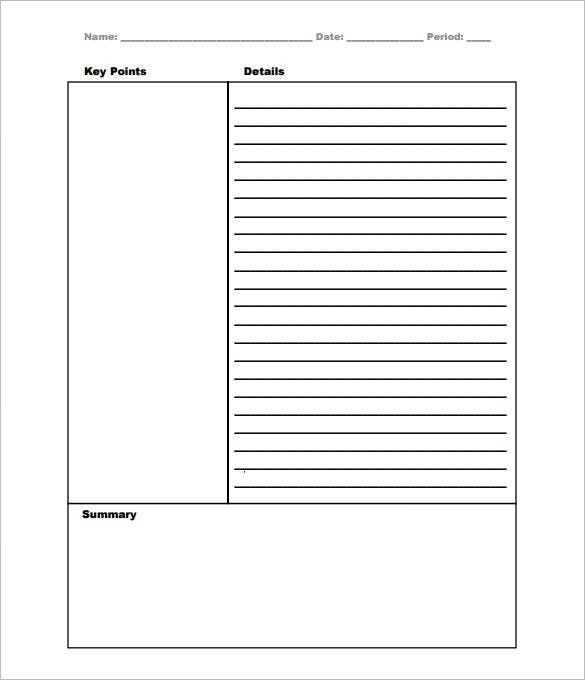 To help the school students in preparing their Cornell Notes system for each lesson, you have school Cornell notes template example today that are free to download. 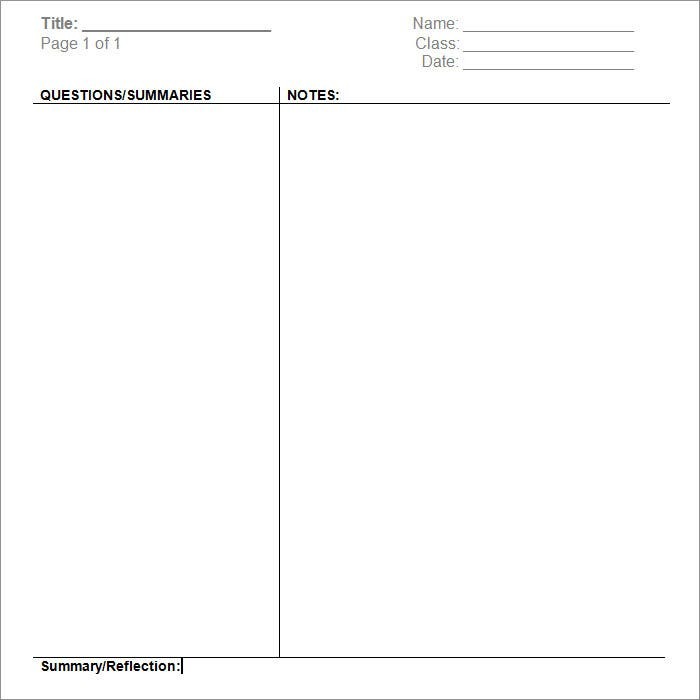 If you want a closer follow up on the notes given and the meeting issues discussed, you can go for the weekly Cornell notes template example. This will help you to stay updated on the most important questions or agendas discussed each week and will definitely lessen much of your load by the end of the month. The Excel sheet deftly emulates the very aura of a class copy with its lined structure and if you are looking to prepare your Cornell Notes system on Excel, take to Cornell notes template excel sample. Here you will get readymade columns and the lined structure of the sheet will ensure that your notes are never out of the line. The best thing about the note-taking system is simplicity. The system is also versatile, which explains why it is such an effective and quite popular method of note taking, which has been adapted by many institutions of learning so far. Did you know there are Cornell Notes Templates that you can use to organize your lecture information? Yes. You can get these and start writing your notes right away without ever having to worry about making the layout from scratch. 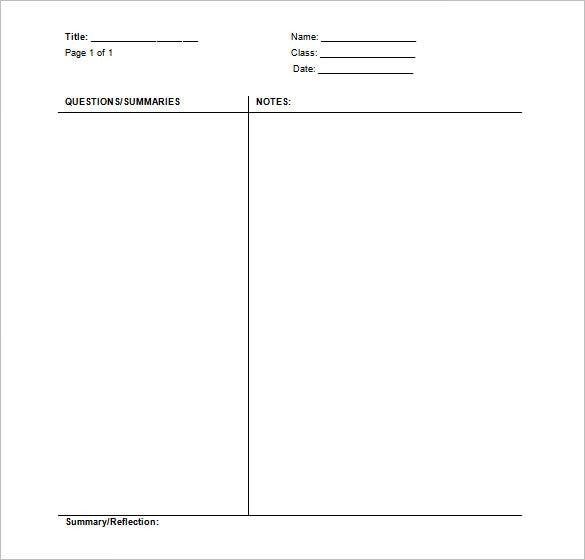 As long as you have access to the internet and a computer system, be sure you are just few clicks away to getting the best Cornell Notes Templates free for download (Cornell Notes Template Download) and print. The first thing you need to know is that this is just a plain piece of paper divided into sections. You do not have to worry about page division because someone already did that for you. The two sections are separated using a vertical line within a space of on inch from the other. The left section of the Cornell Notes Template word is where you write the keyword or the main concept, and the right section is where you will include the notes that describe the concept in question.